The other day I realized that it has been 4 (!) months since my last blog post. I really need to set time aside each week to sit and post something for those who visit here. I won't promise that I will though. Because I know me. I will try, but I can't say I will. I have been furiously working away however. 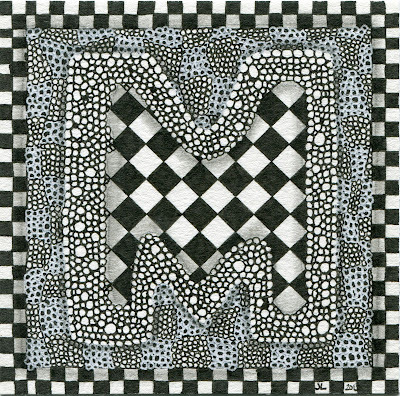 In the attempt to create an alphabet in tangles, I decided that I will try to use the Diva's Challenge each week as not only a challenge for Zentangle but as a double challenge to myself to work on an alphabet tile. I am using some letter cookie cutters that a dear friend gave me long ago as my stencil. I really love cookie cutters as stencils. They come in all shapes and sizes and no printing is required. Just set it where you'd like the design, trace the outline and get get started. This week is the first in the (hopefully) future series of 26. As M was at the top of the bucket, M is the kickoff letter. The challenge is to use just two patterns on the tile. Those tangles are Knightsbridge (a checkerboard pattern) and Tipple (circles). I started with the M, using it as a string in this piece. I drew out the boarder first. I knew I wanted that to be Knightsbridge. 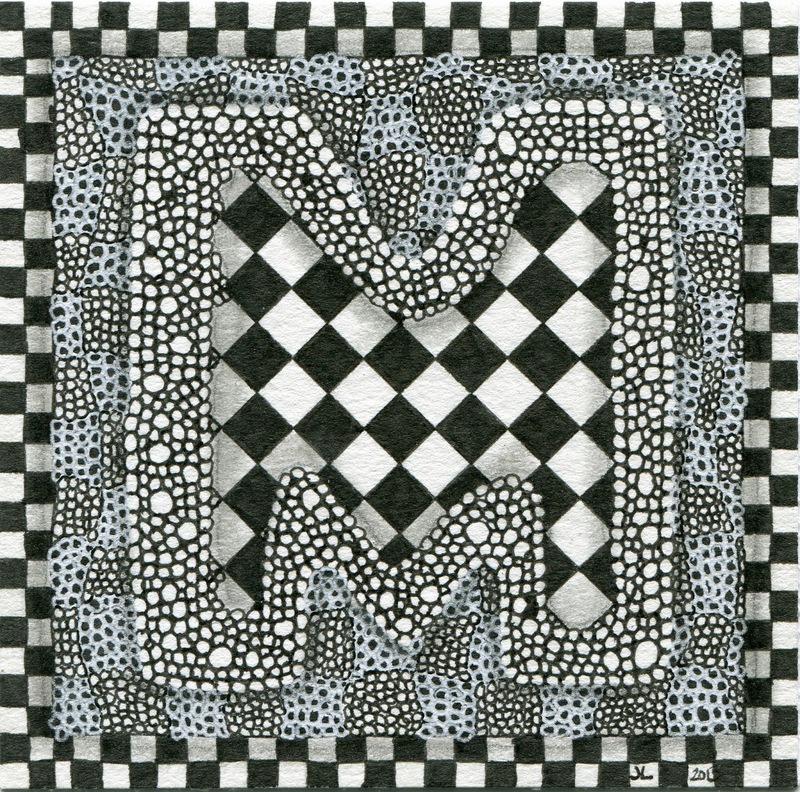 Then I tippled (is too a word) the M. I thought about varying the center here and adding to the Knightsbridge but I decided that simple was the way to go. After getting that done, I had this empty spot that I needed to put something in. The blank paper was just too empty and didn't look right. So after a mid morning trip to Starbucks and the Post Office, I came back to this. With caffeine kicking, I decided to freehand some wonky lines for the Knightsbridge and then Tipple over the spaces. Combining them to make a Tipplebridge. Tee hee! Things were a bit busy there until I got some shading in to pop the M up from the background. Here I only shaded around the M and again at the outer edge, separating the Tipple from the border. In the end, I am happy how this turned out. I wasn't sure that the final tile wouldn't look too busy, it still is. With the shading however, the separate layers "stack" as it were, to make things easy to see. I hope to sit and get some more posts in soon. I have been working on Shrinky Dinks lately. I have been using past Bright Owl challenges to make medallions for necklaces. I have also been doing some rectangle pendants. I debuted them at the local Arden Fair and the necklaces sold quite well. So well, that I posted the remaining in my etsy shop. I have made 4 more in the last few weeks and hope to have them completed soon. So, have a great day all you out there! I look forward to seeing what cool things you have come up with for this challenge. I also really love the tippled knightsbridge border. Cool effect. You did a great job of using shading to enhance this piece. Nice tile. Great idea to use a letter as a string. I looked at your etsy shop as well, beautiful work! Had to pop over to your Etsy shop to see what has kept you so busy for the last few months. Way cool! Your medallions are really nice! A wonderful "M"! I agree to Chris. I like the Tipple in Knightbridge! Your M is very beautiful and has great depth! Very cool! Love the way you tippled the knightsbridge in reverse around the "M"
Like the way M stands out, it looks as if its floating on a carpet. Wow, what a beauty! Wonderful volume "M"! WOW that must have taken long to tipple so much! Lovely tile! Like the roundness you created on the M. Makes it look like it is lifted off the page.